Michael Clayborne, the latest heir to the Clayborne empire, is proud to introduce our customers to this latest version of our wildly popular saddle stool. Our saddle stools have been one of the most popular items on our website, and we have shipped them all over the country. First came the saddle stool with horn, available in 3 different heights. The customers begged for more, so we got you saddle stools with hooves on the bottom of the legs, and then we offered a plain style with handles in the middle so you can move them easily. Now, fresh from the minds of the Amish craftsmen, we have it converted into a rocking chair! These chairs are amazingly comfortable - you just have to sit on one to experience it. The rocking saddle stool is probably available in a variety of heights as well, but I need to wait for Sara to give me sizes and pricing. These stools are typically only available in solid oak. 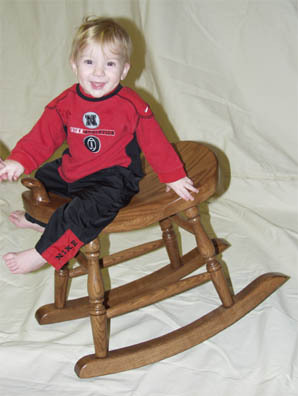 Click Here to see more stool and less kid!